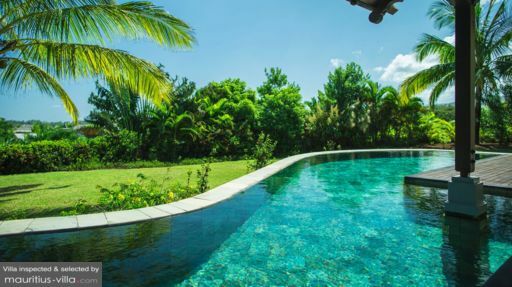 Designed to very comfortably accommodate 14 persons, Villa Santara is ideal for group or family holidays. 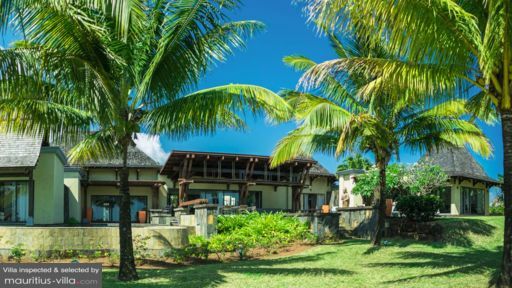 A mere 3 minutes away from the pristine beaches of Mauritius, this villa is situated in the Southern part of the island, where the emerald greenery clashes magnificently with the sparkling azure ocean. With amenities such as free WiFi and private parking, guests will be able to relax and enjoy every moment of their tropical vacation. Guests at the Villa Santara will benefit from seven bedrooms with double or twin beds. Additional beds can be set up at the villa at no extra charge. Four of these bedrooms are suites, with en-suite bathrooms, complete with shower, tub, double sink and toilets. The remaining three bedrooms share a large and luxurious bathroom between them. All seven bedrooms overlook the garden or the ocean. Amenities include wide closets, safes and air-conditioning units. Guests can enjoy a game of tennis on the property in the fully-equipped and flood-lighted court. Villa Santara also boasts a massive swimming pool that provides you with a glorious view of the sparkling turquoise ocean. With barbecue facilities in the tropical garden, you can be sure to enjoy delectable grilled dinners with your friends and family. Best of all, the large terrace also comes with an outdoors dining table and other outdoors furniture which will help you enjoy the warm balmy evenings, punctuated by the lingering aroma of tropical flowers and trees. During the day, you can laze around on the numerous sunbeds in the garden as you enjoy a good book and your favorite drink. A reflecting pool has also been set up near the terrace to make you feel as though you’re dining right next to the water. With a generously sized open-plan interior, Villa Santara boasts a large, airy living room, complete with a flat screen television, coffee table and comfortable couches. The dining room can easily seat up to 10 people. Because Villa Santara is self-catering, guests can make the most out of the numerous kitchen amenities which include- but are not limited to- coffee machine, toaster, oven, freeze, fridge, kettle, microwave, gas and electric stoves, dish washer and the likes. To keep you comfortable during those humid summer months, all the living areas are equipped with air-conditioning units and overhead fans. A plethora of services has been set up to help you make the most out of your holiday. For example, guests can make the most of Villa Santara’s golf cart to get around the massive property. In addition, a baby crib and high chairs can be set up upon request, at no extra fee. An arrival kit is also offered to every guest: this comprises of a free meal, Nespresso capsules, bathroom amenities and the likes. More importantly, guests can also enjoy the services of a housekeeper who will take care of the cleaning and laundry. Airport transfers can also be arranged at an additional fee. 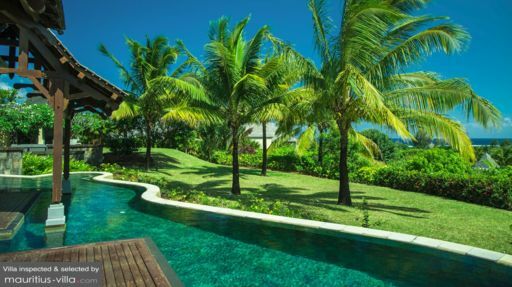 Guests of Villa Santara have an exclusive access to the closest five-star hotel, the So Sofitel Mauritius, where they can enjoy different types of water activities such as snorkeling, kayaking and water ski, among others. Additionally, Villa Santara is a mere half hour away from one of Mauritius’ most pristine attraction, the Vallee des Couleurs Nature Park which is internationally reputed for its seven-colored earth. Not far from the villa, guests can also explore the scenic Black River waterfalls and Paradis Golf Club.